Fido, a wireless subsidiary of Rogers, has launched a contest within the Fido My Account iOS and Android app, called Fido Flip. Wireless customers can play Fido Flip games up to five times per day, for a chance to win over $75,000 in prizes, the company explains. Prizes up for grabs include gift cards worth up to $5,000, plus latest devices from Samsung, Google, LG, plus game consoles from PlayStation, XBOX and Nintendo. To play, just download the latest version of the Fido My Account iOS app—tap ‘more’ in the bottom right corner of the home screen, then tap ‘Fido Flip Game’ to start. The contest runs from October 5 to December 31, 2017, 11:59:59 PM EDT. Recent reviews in iTunes by iOS users claim the Fido My Account app is not refreshing data accurately, with some seeing a 12 hour delay in usage statistics. Earlier this year, the Fido My Account iOS app was redesigned, plus added Touch ID support and push notifications. 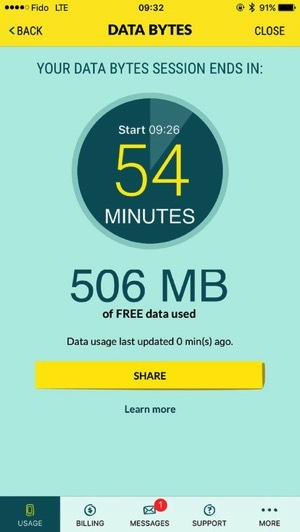 Back in July, the app introduced Data Bytes, which provides customers with five hours of free data per month.